All park district job postings are handled online using a system called Applitrack — including full time, part time, and seasonal employment at Sachs Rec Center, Deerfield Golf Club, and all other facilities. On the Applitrack website you can browse available job postings and fill out an online application to submit for available positions that interest you. Calls and e-mails regarding employment will be referred to the online application system. Is there a fee for the dog park? The dog park at Wilmot and Hazel is free for all well-behaved dogs, and owners are responsible for cleaning up after their pets. Classes that are cancelled entirely due to low enrollment or other factors will be refunded in full. Patrons may choose to receive a refund check or transfer funds to a new class or other park district balances due. Individual class sessions that must be cancelled due to weather, instructor illness, or facility problem may be refunded pro rata or rescheduled in coordination with instructors, participants, and park district resources. Refunds are processed by check, which will be mailed out in approximately 15 business days. How much is a pool pass? Our pool passes offer an excellent value for families of all sizes and singles, and we’ve added plenty of options over the years for the convenience of our patrons. All the information is on the Pool Pass page in the Aquatics section of the website. Don’t forget, register before opening weekend to receive early bird discounts! Do I have to come to the office to renew my pool pass? Pool pass sales and renewals can be handled in person at the JPCC registration office or by fax (downloadable PDF form). Renewals will automatically activate your existing photo ID card, but if you need a new card printed you need to come to the Jewett registration office for a new photo (Mon – Fri 9 am – 4:30 pm, Sat 9 – 11:30 am). Pool pass transactions are not available online at this time. Can I try the facility before I commit to a membership? Yes, we offer 1-day guest memberships — $10 for residents, $12 for non-residents. This includes full use of the facility including locker rooms, group exercise classes, etc. (excludes tennis & racquetball). Is there an extra charge for group exercise classes? No, all group exercise classes are included in your membership or daily fee. Is there a charge to use the track? It is free for members and daily fee visitors. Non-members must pay a $5 fee to use the track; we also offer a 10 visit prepaid punch card for $45. How many times around the track is 1 mile? 10 laps on the outside lane and 11.25 on the inside lane. Yes, we will offer you a locker key at check-in. If you prefer, you may rent a permanent locker for a fee and bring your own lock. Lockers rent for $15.00/month and must be rented in increments of 6 or 12 months. Yes, we offer both large and small towels at the check-in desk and on the fitness floor. At its deepest point, the pool is 4 1/2 feet deep. What is the water temperature of the pool and whirlpool? We maintain the pool temperature at approximately 83 degrees and the whirlpool at 104 degrees. Our pool is open for lap swim during regular business hours. There is always at least one lane designated for lap swimmers. Are there tennis courts? How can I reserve court time? Call the front desk at 847-572-2600 to reserve court time. Do your offer swim/tennis lessons? Yes, we offer both group and private lessons for tennis and swimming. Stop by the front desk or call 847-572-2600 for more details or to schedule lessons. What is the Open Gym schedule? We offer Open Gym hours (basketball) on a daily basis, but it varies from week to week depending on scheduling. The latest Open Gym schedule is always updated on our website, or call 847-572-2600. Do you offer babysitting services at Sachs? We also offer a 20 visit prepaid pass at a discounted rate of $90.00. You must remain in the building while your child is in the babysitting room. When are classes held? Daytime? Evening? Weekends? Classes are held throughout the day. Depending on the day, group exercise classes run in the morning, a few during the lunch hour and then also in the evening. On the weekends, various group exercise classes are being held during the hours of the facility. During the weekday, there’s anywhere between ten and thirteen group exercise classes being held. On the weekends, there are usually between six and eight group exercise classes that run each day. Are you connected with the Deerfield Park District? Yes, we are a part of the Deerfield Park District. You can find more information about them here. What types of programs are available at the PTC? The PTC offers a wide array of programming and services tailored to adults over the age of 50. The broad spectrum of offerings includes: fitness and health, computers, sports and games, Men’s Club and Women’s Club, excursions, special events, cooking, book club, movies, music, film study just to name a few. The PTC also offer Podiatry, cholesterol testing, blood pressure/blood sugar testing and massage therapy services are available by appointment. Please see the PTC bulletin for a detailed listing of current programs and activities. You do not have to be a member to participate in most programs at the PTC. However, there is an incentive to join as many programs offer a discounted fee for those who are members of the PTC. A PTC membership is required for participation in: Men’s Club, Social Bridge, Open Poker, Open Mah Jongg. Knitting, Pool, Ping Pong, Computer Use, and Movies for Members. What is the cost of a Patty Turner Center membership? For Deerfield residents, PTC membership is $30/year per person, and $45/year for non-residents. Memberships are good for 1 year from the date of activation. Do you have handicapped parking facilities? Yes, the PTC has 7 designated handicapped parking spaces. Do you have a Lending Closet? Yes, on a short term basis, the PTC lends durable medical equipment (such as walkers, canes, bath benches, commodes, grabbers, wheel chairs, etc.) to residents of Deerfield, Riverwoods, Bannockburn, and Lincolnshire. The Closet hours are 9:00 am – 3:00 pm, Monday through Friday. How many members are there at PTC? There are over 800 active members of the PTC. Do you offer a bulletin or newsletter? Yes, PTC members receive a bulletin/newsletter in the mail 4 times/year. The Bulletin lists current and upcoming programs and events at the PTC. The PTC Bulletin can also be accessed online at www.pattyturnercenter.org, or found in the brochure racks located in the front lobby of the PTC. How far in advance do I have to register for a program? We encourage everyone to register well in advance of the program/event start date. A program/event may be cancelled if we don’t have enough interest in advance of the start date. Please refer to the specific program/event registration deadlines listed in the PTC Bulletin. Where else are classes held? Are there other facilities? The Patty Turner Center is part of the Deerfield Park District which also offers classes at the Jewett Park Community Center, Sachs Recreation Center and the Deerfield Golf Club and Learning Center. Yes, PTC offers local hassle-free excursions to popular theatre productions and cultural events. We also offer extended tours in partnership with American Classic Tours. Upcoming tours will be announced in the PTC Bulletin and flyers/registration materials are available in the PTC brochure rack and on our website. Where is the PTC located? The PTC is located at 375 Elm Street in Deerfield. How do I become a member at Patty Turner Center? There is a PDF membership form on the main Patty Turner Center homepage — just print that out, and bring it to the front counter along with payment. All the details are on the form. 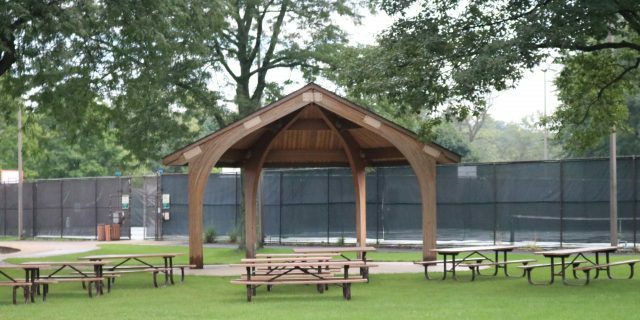 Any financial donations made to the Deerfield Park Foundation may be restricted to a specific purpose, such as for an engraved paver, a donated tree, a specific event, or other mutually agreed upon purpose. Contributions may be made toward a designated scholarship, such as the Linda Gryziecki Scholarship (for college/university/post-secondary schooling) or other project or program; or, as a General Donation. General Donations are typically used to help fund projects aligned with the Foundation’s mission, such as current/recent areas like upgrades to the ThorGuard Lightning Prediction System, to the accessible playground at Deerspring Park, to the purchase of Recycling Containers, or to helping to support Grants-in-Aid for residents in serious financial need to participate in Deerfield Park District programs. Gift Certificates and certain goods and services may also be donated for use as silent auctions or as prizes at fundraising events. Will I get a ‘tax donation letter’ or receipt for my contribution? Upon receipt of any financial contribution for a Deerfield Park Foundation-related activity or project, a personalized letter will be mailed out on official letterhead stationary to the donor. For contributions of goods and services, a similar letter can be sent to the donor, after necessary item description, value, etc. are determined. The Foundation may also be contacted when our tax ID number or other information is required.